Should California Governor Jerry Brown Take a Victory Lap? "Memento Mori" – "Remember your mortality" – was whispered into the ears of Roman generals as they celebrated their great military triumphs. Someone should be whispering something similar in the ear of Gov. Jerry Brown, who has been quick to celebrate his tax and budget "triumph" and to denounce as "declinists" those who threaten to rain on the gubernatorial parade. Brown speaks about California's "rendezvous with destiny" and the state's "special destiny... more vibrant and more stunning in its boldness." His pitch certainly has persuaded much of the mainstream media to add their horns to the triumph. Yet right now, despite its many blessings, our state remains more on a collision course with mediocrity – at best– than with any such manifest destiny. California may not be a "death-spiral state" as some conservatives suggest, but Brown's triumphs – the Proposition 30 tax increases, the marginalization of the GOP as well as his Democratic rivals – have been more political than substantial and have done little to address the state's major long-term challenges. Let's check this out. Unemployment remains the third-highest among the states; we still have one-third of the nation's welfare recipients; the highest poverty rate in the country, with one in five of California's diminishing ranks of children living in poverty, including more than a third of children in Fresno. Our education system, with new dollars or not, continues to fail young people and our economy. Critically, the three key elements typically invoked to promote the comeback meme – budget relief, the genius of Silicon Valley alchemists and "green" jobs – are themselves suspect. Even Brown, who suggested that we could create 500,000 jobs from his climate change agenda, isn't speaking much about it. In California, and across the nation, "green jobs" have failed to materialize enough to offset the higher costs imposed on the rest of the economy, the high public subsidies and parade of failed ventures associated with these policies. Yet, Brown is so dogmatically loyal to this agenda that he remains committed to massive regulation of the economy, which is slowing growth. And he shows – despite his occasional bouts of fiscal sanity – no signs of backing away from his financially troubled bullet-train fantasy. If green economics are failing, can Silicon Valley bail out the state? Reporters anxious to celebrate our deep-blue state's comeback almost always genuflect to the tech industry. They rarely bother to look at the fact that, even with considerable growth in the tech sector over the past two years, the valley has not even recovered the job levels of a decade ago. More troubling still, Silicon Valley is becoming less an exemplar of capitalism than the beneficiary of an insider game that relies on access to capital and contacts more than on innovation. It is also becoming increasingly dependent on government largesse: No one bet more on subsidized "green" companies than the venture-capital elite. Prospects are also dimming for social media, the valley's latest signature industry. User interest in Facebook is slipping, notes Pew, and the industry now sees its next great opportunity, of all socially worthless things, in online gambling. Even under the best of circumstances, Silicon Valley is neither robust enough nor predisposed to help solve the state's long-term fiscal challenges. In fact, the high-tech darlings of the progressives, such as Google and Apple, are turning out to be as adept in not paying taxes as are Mitt Romney or General Electric. For its part, Facebook now appears to have paid no income taxes at all last year. In fact, the only thing bailing out California is not growing tech firms, but the enormous legacy of wealth, including inherited wealth, that has built up in our state over the past 30 years. California is still rich in rich people, whose stock and real estate holdings are gaining value. As long as Uncle Ben's printing press hands out free money, California could collect enough in state income taxes to perhaps balance its annual budget for a spell. None of this places, to say the least, California on a firm footing. So at the risk of engendering some gubernatorial ire, here's my memento mori suggestions for restoring California's promise. This starts with the assumption that the elements of a true revival exist and that, if Brown would shed some of his dogma, he may end up deserving his current plaudits. • Get real on the budget.Asset bubbles may rescue the state from annual budget woes, but the state's long-term prospects remain cloudy, due largely to mounting government employee pension costs. Attempts to revise the game for new employees are not sufficient to scale the state's mounting "wall of debt"; Californians per capita now owe almost five times as much to Wall Street as residents of our chief rival, Texas. Analyst Joe Matthews suggests we need more drastic fixes, such as cutting off retirees' health benefits after they reach Medicare age. • Redirect the climate-change jihad. California can keep leading in conservation but needs to adopt a more pragmatic people-friendly approach, such as by encouraging telecommuting and energy-saving technologies. In contrast, the current high-density housing diktats and ultra-expensive "green" energy will force up prices for housing and electricity rates way out of proportion to national norms. This damages the middle and working class even if it won't impinge on the lifestyles of Brown's rich and famous friends. • Focus on basic industry. Tech and entertainment can never drive enough jobs or wealth to support this huge state. But California is blessed with the country's richest soil and huge fossil-fuel reserves. These could bring in new revenue to the state and create new jobs for a broad number of Californians, particularly in the hard-pressed interior. Particularly critical is the state of the water system, which once again faces large cutbacks because of pressure from environmentalists. Brown has spoken in favor of a peripheral canal; solving the water problem may leave him with a greater legacy than the dodgy bullet train. • Reform the education system. More money alone won't save the schools, but may be used only to prop up the pensions of teachers and administrators. Some kind of radical reform – perhaps school choice, vouchers, mass use of charters – must be the price of any increase in money to education. Brown has made some reformist noises with the University of California, but he remains tethered to the teachers unions on K-12 schools. • Invest in economically needed infrastructure. Besides the peripheral canal, Brown should look at expanding the state's energy supply by permitting the construction of low-polluting, economically efficient gas-fired power plants. Rather than waste money on a "train to nowhere," he should be looking at fixing roads, bridges, ports – the sinews of a modern economy – and improving existing inter-city trains (and buses), particularly in high-volume corridors in the Bay Area/Sacramento and across Southern California. • Prioritize blue-collar opportunities. California's greatest challenges lie with a widening class divide. Bolstering manufacturing, which is in a secular decline here, and restarting construction could create new opportunities for blue-collar workers. Port expansion would create lots of jobs in everything from warehousing to assembly and business services. This can be meshed with revitalized training programs for the skilled trades. In simple terms: California needs more skilled machinists, electricians and irrigation technicians and likely fewer marginally employable ethnic-studies or humanities grads from second- and third-tier schools. One can understand why our governor, at age 74, wants to enjoy his triumph. But to deserve the laurel wreath, he first needs to make the major changes that can bring this greatest of states back to its historic potential. 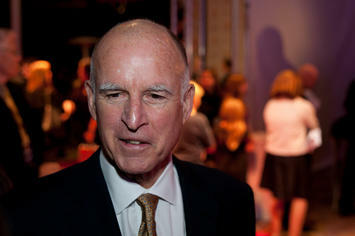 Jerry Brown photo by Bigstock.